Our analysis suggests that the combined company can make $15.50 per share in 2022, 4 years after the deal closes – 3x what the pro-forma EPS was for 2016. We expect a PX equivalent share price of at least $300 in 2022 – roughly 120% higher than current levels – compound annual growth of over 18% from today’s price. Worst case downside is $230 per share – 11% compound. The combined company will grow revenue faster than the competition at higher rates of return than in the past, because of its expected lower cost of project delivery. We are assuming that the company will only take the high return investments rather than try to squeeze out APD, AL and others completely – see prior research. The company will beat synergy goals: both timing of the initial estimate and quantum. Free cash, including from expected required divestments, used to buy back stock; as much as 20% of the pro-forma 2018 outstanding share base by the end of 2022. 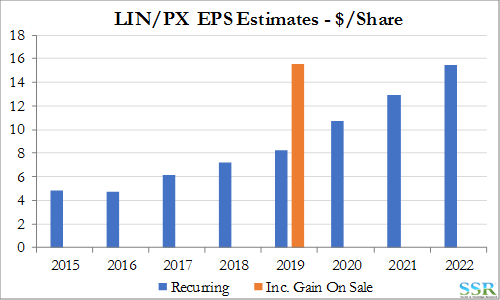 Conservatively, we are assuming a long-term EPS multiple of 20x for the stock – today, PX’s multiple is 25x, which is discounting some of the potential deal upside in our view. We are assuming a tax inefficient divestment of around $3.5 billion (sales) to keep the regulators happy assuming a $10 billion value with a $5 billion taxable gain. If the new company can find a tax efficient exit – we can think of two routes – the share buyback could be larger – as much as 25% larger with one option. Our bridge to 2022 EPS is summarized in Exhibit 1. We do not see any other story in the Chemical space that can deliver this much long-term value with this little risk/volatility. Some commodity names have the potential to double, but also the potential to halve. 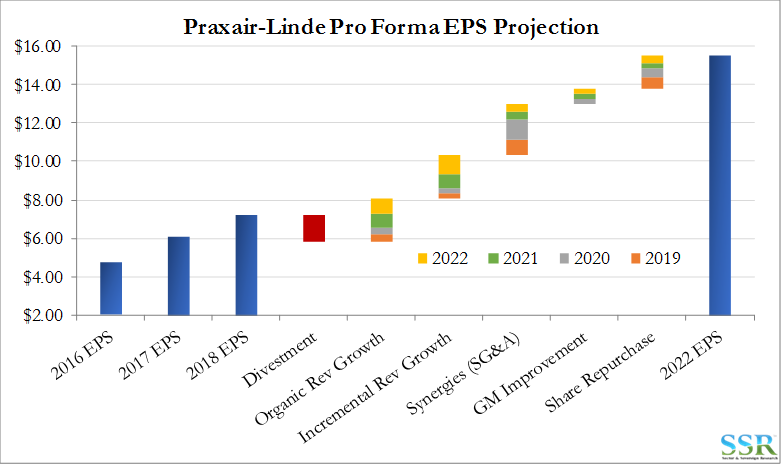 We have built a comprehensive financial model for the Linde/Praxair combination, something we do not normally do at SSR, but with the many potential positive moving parts we wanted to check that our upside potential analysis was robust and run the numbers more rigorously. We like this deal because we think there are a number of straightforward unique growth drivers; and there is no need to make ambitious or aggressive assumptions to get very positive very quickly. The opportunities fall into three buckets – higher value (and higher) revenue growth (i.e. more dollars spent on projects with high returns) – synergies (plenty initially and then more over time) – and cash management; deploying enough capital into new projects to gain share, while at the same time supporting a substantial buyback. The bulk of the buyback should come from the cash generated from the sale of assets required by the regulatory bodies to get the deal done. Here, we would expect the companies to be proactive in presenting regulators with a divestment “straw man”, in the hope that they can then manage the sale process as tax efficiently as possible, either by splitting (rather than spinning) off all the required assets into a separate New-Co, or through a Reverse Morris Trust type transaction – possible but complicated and also requiring some sort of initial split. A share split would be the most efficient way to buy back stock as it would be a one-time event at, or immediately after, the deal close – more share reduction at a lower price. Note that in Exhibit 1 we are assuming reasonable base EPS growth, which includes some measure of buyback. Our EPS estimates by year are summarized in Exhibit 2, and a summary of expected funds flows in Exhibit 3. In our model, we are assuming that the deal is executed well – the companies will be given plenty of time to plan and to identify synergies precisely – we believe that there is as much likelihood of synergies being higher than the almost $2 billion we are assuming as there is that synergies will be lower than our estimate. Management also has time to craft a good divestment strategy for assets that will need to be separated to keep the regulatory bodies satisfied. We show some scenarios on possible divestment values later in the report. 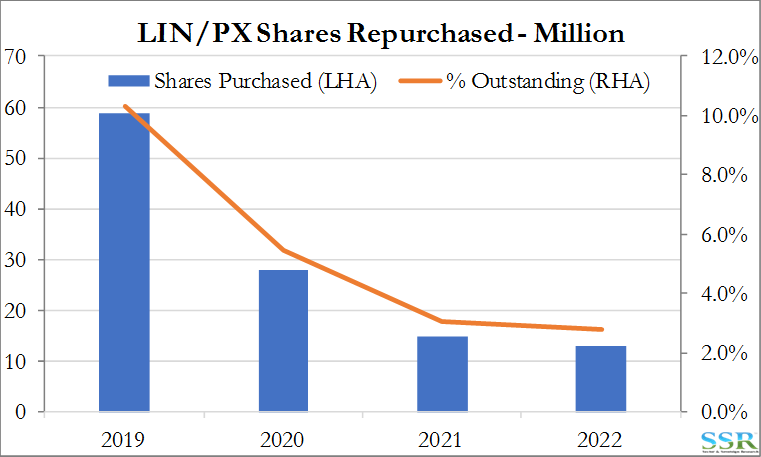 Worst case on the buyback would be 4-5% fewer shares repurchased than we expect, which would knock around 77 cents per share off our 2022 estimate. Competitive response is much harder to read – if APD, AL and others do not let LIN/PX take the capital opportunities that we think they should win, then we could see margin deterioration and more limited capital growth. There would be a slightly larger buyback – because of more cash and because of a likely lower share price. Worst case EBITDA is $2 billion lower than projected in 2022 – a reduction in EPS of $3.25-3.35 versus our estimate. Combining the risks gives a downside 2022 EPS estimate of around $11.50 per share – with a 20 multiple – $230 per share – 11% compound growth. The divestments will create a new competitor or strengthen a smaller one. LIN/PX will either win new business because they are a lower cost provider – i.e. better for the customer – or others will undercut LIN/PX to try to gain share – lower margins for them but the customer wins again. This is predicated on the thesis that there is too much capital/cash generated by the industry to meet forward investment needs – see prior research – linked below. In prior research (linked here) we have discussed what we think is one of the larger opportunities for the combined company, which is better revenue growth, through some market share gain, and better returns on that investment – reflected in higher gross margins, and higher EBIT (lower D&A per dollar of incremental revenue). We have not been overly aggressive on the capex side, assuming that the industry can spend around $6.5-7 billion a year on traditional industrial gas projects with new Linde taking $4.5 billion. In the prior research, we noted that new Linde will likely have the cash flows and the cost base to take all of the new capital opportunities in the traditional sector, but we are assuming that the company maintains a disciplined return on investment threshold. We have assumed a 100 basis point gain in revenue growth for the company in 2021 and a 150 basis point gain in 2022, with minimal improvement in 2019 and 2020 because of the length of time it takes for new investments to hit the top line. We have, however, assumed an improvement in gross margins almost immediately as we would expect some (though not much) of the synergies to come from improvements in cost of goods sold. Underlying revenues, incremental revenues and the associated improved margins are summarized in Exhibit 4. The higher margin/higher return investment assumption is a significant driver of expected earnings growth in 2021 and 2022. Note that the base EBITDA assumption for 2019 is around $8.4 billion and accounts for the expected divestments required to get the deal done – $3.5 billion of revenues at average company gross margins. We think there is likely to be a very long tail to the synergy opportunity. Initial synergies are likely focused on easily identifiable costs where lay-offs are not challenging. We would expect much of this to be in the US initially. However, there are likely to be head-office and SG&A costs all over the world, some of which will take more time. In the Exhibit 5 below we show both SG&A and SG&A as a percent of revenues. We are assuming that some of the SG&A costs are divested with the required divestments and this is reflected in the 2019 EBITDA numbers in the percentages at the bottom of the table – as noted above, base EBITDA for 2019 is estimated to be $8.4 billion. 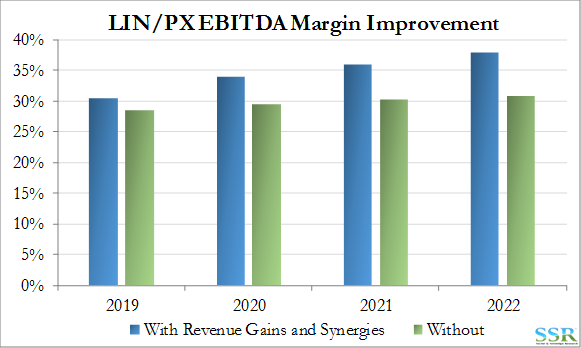 The overall impact of the revenue gains and SG&A synergies can be seen in the EBITDA margin difference shown in in Exhibit 6. A major part of the story here will be the use of a growing pile of cash. We are assuming that the company can increase capex relative to the current pro-forma rate, but we only assumed a modest share gain from the other industrial gas companies on the basis that the new Linde chooses to take only high return business. It is possible that the company could push for a higher share of new business and compromise returns but this may result in some unwelcome competitive behavior from others and bring new business returns down for the whole industry. As shown in Exhibit 7, even with this higher level of capex, there is plenty of spare cash generated and we are assuming that all of this is used in share buyback. Note that we expect neither company to buy back stock prior to the merger close and consequently by end 2018 there is accumulation of cash on the combined balance sheet of almost $5bn – before any divestments. That cash, plus the divestments allows for the substantial buybacks in 2019 and 2020 – by 2021 the buyback reflects cash surplus to capex and dividend needs. We have assumed flat working capital throughout – not an unrealistic assumption given that working capital is likely to be a source of additional synergy gains. Another key set of assumptions that we have made is around the divestments of assets required to be sold to satisfy the regulators. We have assumed that the company will need to divest $3.5 billion of revenues – towards the upper-end of the range provided when the merger was formally announced. We have assumed that these divestments will raise as much as $10 billion, given the high margins and predictable earnings of the business. We have also assumed that the sale is tax in-efficient and that book value is $5 billion (it is possible that book value could be lower than $5 billion). We have taxed the gain at 25%, but if the assets are more heavily weighted to the US the tax rate will be higher. In Exhibit 8 we show what we think is a reasonable range of assumptions – potential proceeds and the likely number of shares retired. We believe that we have been conservative in our assumption around the share price (i.e. possibly too high in each scenario). There is a big difference between a tax efficient and a tax inefficient exit. We are not even sure if a tax efficient exit is possible, but show the scenario for illustration. We think such a move could only be achieved through a spin/split or an RMT based sale, preceded by a stock split (as in the PPG/Georgia Gulf deal). The yellow highlighted line is the assumption in our model. We have assumed that the new company keeps the Linde engineering business. It is a low margin business but today the E&C space is trading at or close to 15 year lows – Exhibit 9 – and has seen very disappointing trends in return on capital. The Linde business has not fared much better than the industry average with EBIT falling from a high of €312 million in 2012 to €140 million in 2016. While this may not be a strategic business for the new company longer-term, now is not the time to sell though we are unlikely to see a peak in valuation without some significant industry reconfiguration. 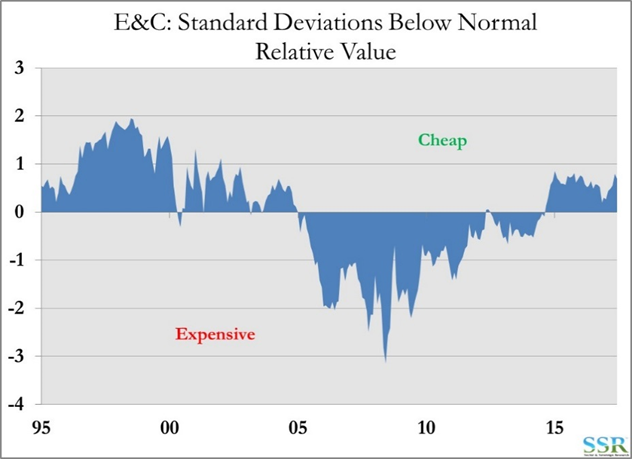 The E&C space is a mess today with companies at earnings and valuation lows when business should be at its best – this will be the subject of separate research. Today at current E&C multiples this business is not worth much more than $1 billion net and the new company might be encouraged to do something pro-active with the business rather than simply sell it (merge with another – create synergies – and then sell or spin). Linde has won some significant EPC contracts recently, but this may be more a function of how poorly others are performing than how well Linde is doing.